Yes, obviously I put RIT in the finals: they are arguably the hottest team across every game in the CSL right now. But, I am putting my money on Stony Brook to take the Grand Prize and - more importantly - desecrate RIT’s flawless record of winning every series in the last four semesters. In RIT’s interview, they mentioned that Stony Brook should not be underestimated. I think that the Winter Invitational is Stony Brook’s chance to show every group that they have what it takes to win it all this year. The SMU Mustangs are ranked first in the Power Rankings, but Stony Brook’s experience from playing on LAN last year gives them an edge in the tournament format. Stony Brook has to best Ohio State before they face SMU, but Stony Brook’s advantage against SMU is relevant against Ohio as well. This will be the first time we see the most dominate schools play matches outside their Fall groups. If the tournament goes according to my bracket, I am more excited for the semi final matches than the grand finals! 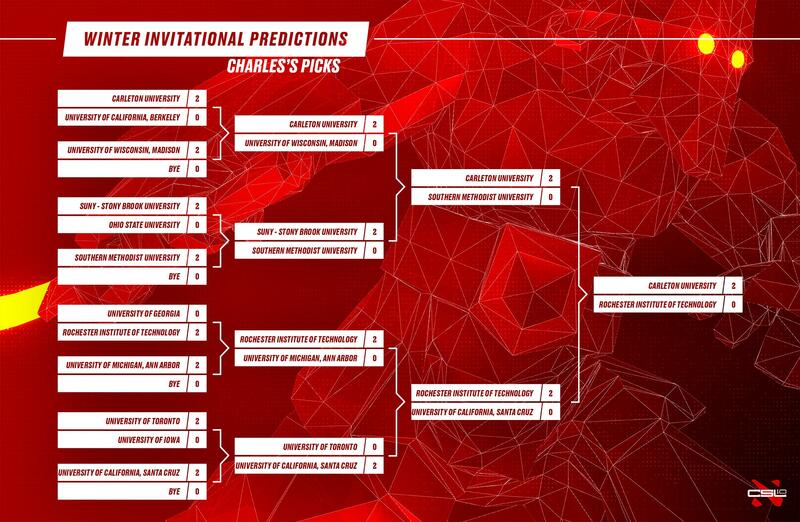 I do not care if my bracket is accurate or not, every spectator is a winner with the new CSL format. For the teams in the Winter Invitational, they’ll have to quickly shake off any holiday rust and step up their game against the best teams in the league. A new year brings with it a fresh perspective and willingness to play the best you can, especially with the new matchmaking season coming soon™. I believe that all the teams are good enough to take games off of each other, so I don't have strong feelings over one team beating another. I feel that the final will likely have RIT in it, and Carleton seems the most likely opponent to survive the top half of the bracket. There’s no reason Iowa vs Berkeley can’t be the finals, all of these teams have proven that they are the best of the best in the league so far, it’ll largely come down to who wants it more. With the newest matchmaking season and release of Mars coming soon™ who knows if the Dota these teams performed so well in will be the Dota they compete in. It’s also worth considering that 7.20 is still relatively new and ductile, especially concerning the CSL, so I wouldn’t be at all surprised if the most unlikely results are the ones that come to fruition.